(Nanowerk Spotlight) Lithium (Li) metal-based batteries such as Li–sulfur and Li–air batteries have received considerable attention because Li metal can store 10 times more energy than graphite. However, there are safety and performance concerns for these types of batteries that arise from the formation of dendrites on the electrodes; an issue that has been known and investigated since the 1960s. These dendrites form when metal ions accumulate on the surface of the battery's electrodes as the electrode degrades during the charging process. When these worm-like deposits elongate until they penetrate the barrier between the two halves of the battery, they can cause electrical shorts, overheating and fires. They also cause significant cycling efficiency losses. Therefore, inhibiting the uncontrolled growth of Li dendrites is critically essential towards the full utilization of Li metal anodes. Many approaches have been proposed to retard the growth of dendrites through, for instance, electrolyte modification, artificial solid electrolyte interphase layer, electrode construction. 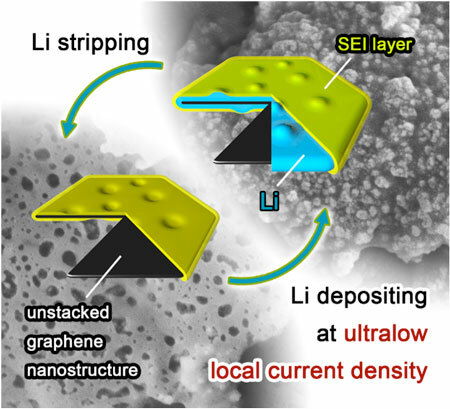 Recently, researchers in China have proposed an unstacked graphene nanostructured lithium metal anode for lithium metal batteries to inhibit lithium dendrite growth and bring superior electrochemistry performance. The work, led by Qiang Zhang, an associate professor in the Department of Chemical Engineering at Tsinghua University, has been reported in Advanced Materials ("Conductive Nanostructured Scaffolds Render Low Local Current Density to Inhibit Lithium Dendrite Growth"). "We noticed that, by heavily decreasing the local current density, lithium dendrite growth can be efficiently inhibited," Rui Zhang, a Ph.D. student in Zhang's group and the first author of the paper, tells Nanowerk. "Based on this concept, we employed unstacked graphene with ultrahigh specific surface area to build a nanostructured anode. And it turned out to be a very effective idea." "Essentially, we have constructed a distinctive nanostructured Li metal anode entrapped in unstacked graphene 'drum', " says Zhang. "The graphene-induced ultralow local current density indicated a superior performance in inhibiting Li dendrite growth." high electrical conductivity (435 S cm-1), leading to low interface impedance, stable charging/discharging performance, and high cycling efficiencies. "The ultralow local current density induced by conductive nanostructured anodes with high specific surface area can help improve the stability and electrochemistry performance of lithium metal anodes," notes Xin-Bing Cheng, another team member and co-author of this work. "We hope that our research can point out a new strategy to deal with the dendrites challenge in lithium metal anodes." "A key focus of our future investigations will be the design of a preferential anode structure and producing a more protective solid electrolyte interphase layer," concludes Zhang. "It will also be necessary to investigate the diffusion behavior of Li ions and electrons in the process of lithium depositing and stripping to advance the commercial applications of lithium metal anodes."